Thought to have been written/compiled by an unknown Judahite exile, 1 and 2 Kings were originally one literary work. Translators of the Septuagint (early Greek translation of the Old Testament) divided the original work (called simply “Kings” in the Hebrew tradition) into two books around A.D. 400. Because both have similarities to the book of Jeremiah, some scholars have attributed all three books to this renowned prophet, but this theory cannot be verified. Perhaps the author of 1 and 2 Kings used the book of Jeremiah – as well as Isaiah – as a source (Isaiah 36, e.g., is virtually identical to 2 Kings 18:13-37, but cf. 2 Kings 24:18-25:30 to Jeremiah 52:1.34 and 39:1-10). Clearly the autor used many sources, including three that are specifically named (1 Kings 11:41, 14:19, 29).’The ending of 2 Kings 25 suggests that 1 and 2 Kings were written/complied during the reign of Babylon’s Evil-Merodach, after Jehoiachin’s release from prison (562 B.C., 2 Kings 25:27-30) but before the Babylonian exile ended in 538 B.C. Some scholars, however, suggests that earlier “editions” of both books were supplemented with material from Israel’s later history. Their primary basis for believing that earlier editions existed is the presence of statements to the effect that something is “still here today” (cf. 1 Kings 8:8). Much information in these two books did undoubtedly originate from earlier sources, whose authors had direct access to details of Israel’s history. Perhaps these sources were the official court annals in the archives of the kings of Israel and Judah, as compiled by the succession of Israel’s prophets spanning the kingdom period. The books of Kings were originally written for the Jews living in exile in Babylon to preserve a detailed history of Israel and Judah – from the last days of king David (ca. 970 B.C.) to the exile to Babylon (ca. 586 B.C.). 1 Kings includes the history of the united kingdom under king Solomon (1:1-11:43), as well as that of the first 80 years of the divided kingdom of Israel and Judah (12:1-22:53). 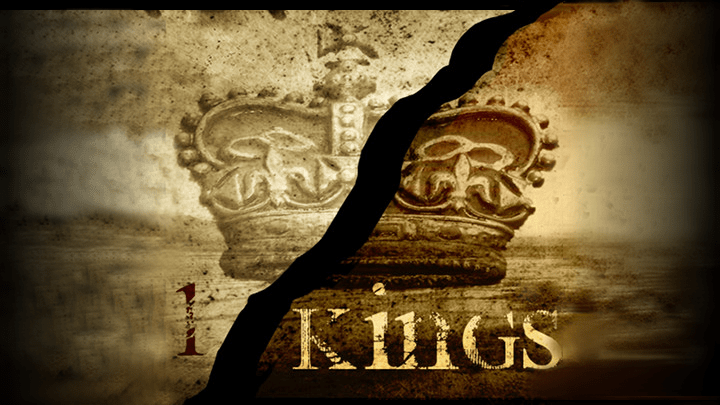 Readers of 1 Kings especially were confronted with the northern kingdom’s apostasy and the ways in which God tried to use the prophets Elijah and Elisha to turn the people back to covenant faithfulness. Although 1 Kings begins with Solomon’s succession to the throne, his request for God’s wisdom and the construction of the temple, the situation soon deteriorated from many perspectives. Solomon imposed heavy taxation, used slave labour and allowed his many pagan wives to draw him into idol worship, and his blatant disobedience sowed seeds of evil that soon sprouted. The nation of Israel split apart. Later kings also disobeyed God’s covenant and decrees, further weakening the influence of God’s people in their culture and setting them up for great instability and hardship. As you read; picking up where 1 and 2 Samuel left off, 1 Kings presents the continuing story of Israel’s declining monarchy. Notice what happened when God’s people disobeyed their covenants with God and disregarded His prophets. Track their continuing inclination toward sinfulness and lack of repentance, a trend recorded in previous Old Testament books. Listen as an elderly David urged his son and successor, Solomon, to remain obedient to God and to pay close attention to the consequences of his actions. Learn why the nation of Israel split apart and what king Jeroboam of Israel had to say about his golden calves. Finally, note the standard by which kings were judged and the courageous faith Elijah and Elisha demonstrated as they served God during this violent, unstable time. Did you know that most ancient prostitutes were slaves, often daughters who had been sold by their parents or poor women who had never married or had lost their husbands (3:16)? Did you know that since Solomon had 1,400 chariots (10:26, 2 Chronicles 1:14), his stables included stalls for 2,800 chariot horses (two for each chariot), with additional stalls for 1,200 horses (1 Kings 4:26)? Did you know that ancient wisdom included music, poetry, proverbial sayings for wise conduct and what we would now call science (4:29-34)? Did you know that it was common during Old Testament times for the people of one nation to recognize the deities of another (5:7)? Did you know that the Palace of the Forest of Lebanon was so named because its many pilars were made from the trunks of cedars of Lebanon, giving the appearance of a massive forrest (7:2)? Did you know that the “Sea of cast metal” was an enormous reservoir of water, holding about 43,527 litres and used by the priests for ritual cleansing (7:23)?